Indian history written by Britishers have tried to fix most of the events 1000 years later to match their idea of the world being created in 4004 BCE. In this process, many western historians including Sir Willian Jones have tried to merge Chandra Gupta-Maurya with Chandra Gupta (they thought both are same) and this Wrong history is taught in Indian schools and colleges. The fact is that Gautama Buddha or Siddhartha was born to King Suddhodhana of Ikshvaku dynasty. The lists of kings of Ikṣvāku or Aikṣvāka dynasty are found in the Ramayana, the Mahabharata, the Harivamsha and the Puranas. The Raghuvamsha of Kalidasa also mentions the names of the kings of this dynasty. 03. Bharata : He is the son of King Rishabha and founder of the Sun Dynasty (Suryavansha). Among the hundred sons of king Ikshvaku, Bharata is the eldest one. Because he has very broad chest of a warrior, he was also called as Kushki. 24. Mandhata (Chakravarti Samrat) killed by Lavanasura in Mathura (He defeated Ravana). Conquered the Druhyus and vanquished Nriga, Marutta, Jaya, Suna, Sudhanwan, Angara, Gaya and Asita. In the Ramayana, we find that, Lava and Kusha were the sons of Rama. Puranas provide a genealogical list from Kusha to Brihadbala, who was killed by Abhimanyu in the Mahabharata war (3138 BCE). 115. Brihadbala (at Mahabharata time, Abhimanyu killed Brihadbala at age 125 years in Mahabharata War). Average lifespan of a human kept dropping with each Yuga. Brihadbala was killed in the Mahabharata war by Abhimanyu. His son “Brihadkshana” became king after the war. Last king Sumitra was killed by Mahapadma Nanda in 1634 BCE. Chanakya was contemporary to this Mahapadma Nanda (Dhana Nanda), who placed Mahapadmananda’s protege Chandragupta, son of Mahapadma Nanda by his wife ‘Mura‘ on the throne of his father. Which means that Ishvaku dynasty ended with Sumitra. This was also mentioned in Matsya, Vayu and Brahmanda Puranas. Vishnu Purana also mentions that He, who was called Maya Moha in his previous birth, will be born as Siddhartha to King Suddhodhana. By propagation of his teachings, many give up their traditional vedic religion to adopt new religion of Buddha and will be called as Bauddhas. Buddha was the contemporary of Kshemajit, Bimbisara and AjataSatru, the 31st, the 32nd, and the 33rd kings of Magadha. The Buddhistic works say that Buddha was Seventy-two years old at the time of AjataSatru’s coronation. According to the Puranas AjataSatru’s coronation was in 1814 BCE. 1. Buddha’s brith – 1887 BCE. 2. Buddha’s Remunication – 1858 BCE. 3. Buddha’s Penance 1858 – 1851 BCE. Buddha’s total life period 80 years, (From 1887 – 1807 BCE). 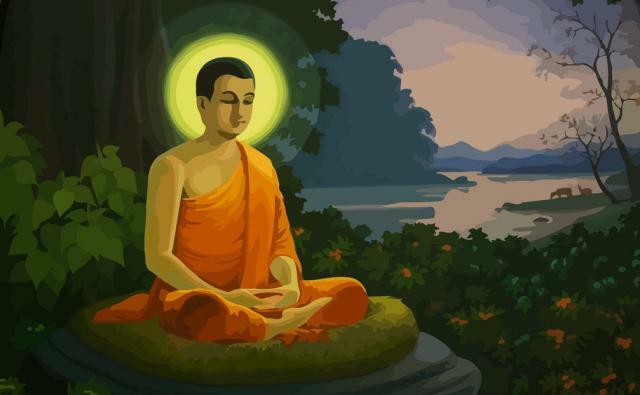 Buddha or Siddhartha was born on Poornima (fullmoon day) of Visakha lunar month. Thus Gautama Buddha’s exact birth date according to astronomical analysis would be 9th April, 1887 BCE. He attained wisdom on 03 April 1851 BCE, which was same lunar day and also a full moon day on a Wednesday. Also, Death of Buddha happened on same lunar day, which is Vaisakha full moon with Nakshatram as Visakha. That was a Tuesday on 27 March 1807 BCE, which is a full moon day. This date matches with the existence of Buddhism in the second milinnium B.C., as mentioned in Kalhana’s Rajatarangini and NepalVamsavali. All the dates given in Bishop Bigandet’s “The Life Or Legend Of Gaudama” in the Kaudza and Eetzana Eras have been verified with the dates in Christien Era. The dates tally accurately with 27 March 1807 BCE as the date of Nirvana of Lord Buddha. How this Siddhartha (Gautama Buddha) is regarded as Avatar of Lord Vishnu ? As Siddhartha was born in lineage of Lord Rama in Ikshvaku dynasty, people of his generation might have considered him to be incarnation of Rama or Vishnu. It is commonly accepted amongst those monks that Buddha Rishi (Vishnu Avatara Buddha) was a predecessor of Gautama Buddha. Siddhartha, who became Gautama Buddha came to the original Buddha’s birthplace to practice meditation. Gautama Buddha chose this place to attain liberation, knowing it to be saturated with immense spiritual power. Interesting mention of Buddha is made by Lanka king Ravana in Lankavatara Sutra . Translation : O Supreme Lord Buddha! I offer my obeisance unto You, Who is faultless and have appeared to delude the demoniac and atheistic class of men. Translation : Then in the beginning of Kali-yuga, the Lord will appear as Buddha, son of Anjana, in the province of Kikata (Gaya), just for the purpose of deluding those who are envious of the faithful theist. Here, Kikata is ancient name of the place, Gaya. Gautama Buddha came almost 1200 years after Kali Yuga started. So, there must be the original Vishnu Avatar Buddha, who came early in Kali Yuga as son of Anjana. But again, Bhagavata Purana was compiled during times of Gautama Buddha and the avatar of Vishnu as Buddha is debatable. Jataka tales or stories of Buddhism mention one story where Buddha in one of his past life was trying to teach Ahimsa (nonviolence) to queens and King misunderstood his intentions as to be flirting with his wives. King orders Buddha to be tortured until death. After multiple such lives, where he failed to establish nonviolence through teahcings, in his last life, he attained wisdom at Bauddha Gaya and attained nirvana after preaching his ideas to his followers. Later, his followers converted many kings and common people into their religion. What Adi Sankaracharya (509 – 477 BCE) tried to drive away from India, was followers of Soonyavada Gautama Buddha, as it was promoting only begging during his time. The original buddha’s history and teaching have vanished as Gautama Buddha’s religion was spread across India and adopted by many kings. Infact, few traditional Vaishnavaites do not consider Buddha as Avatar of Vishnu. “Matsya kurma varahascha naarasimha vamanaha ramo ramascha rama scha krishnaha kalkirevacha” is what they follow. And in this order, Balarama is considered one of the Avatar.